When I first learned about Fred Provenza’s nutritional wisdom research, there was an uncomfortable frisson that maybe I didn’t really need herbicides, but I managed to suppress it. And whenever someone referred to organic wool I had a passing moment of wondering how the devil they managed the woody weeds. And then there was the time during the 3-year “long dry” when it dawned on me that I was heading out to kill more or less the only plants on the property that were still growing. Sheep browsing less dense gorse earlier this year. More recently, I had a visit from Robin Blackwood, a native Tasmanian who works in different parts of the world with the International Transcendental Meditation organisation. She had heard about White Gum Wool through a connection in the Alliance of Women Scientists and Scholars for a Better World. While back here in Tas, Robin came to see me and have a tour of the farm. The only point where Robin’s eyebrows squinched up was when we got to the big gorse patch out the back, and she realised that I was still using herbicides on the gorse. I explained why I needed to, and in her quiet way, all she said was, “There must be some other way.” She was almost talking to herself, rather than to me, but I overheard her. Perhaps because Robin is so understated, her comment stuck with me, like a small burr under my saddle blanket. That sensitivity, I suppose, is what let in the message from the universe that finally got my full attention: reading through the rest of Allan Savory’s Holistic Management tome. He makes a compelling case for using grazing animals to work through whatever issues are standing between you and the way you want your landscape to function. I realised it was time. What finally got through to me was that as long as I have the crutch of herbicides, I’m not actively looking for a grazing solution. Even though I don’t know exactly how I’m going to manage without herbicides, I know enough to figure out where to start. So, for the next 5 years, if not forever, I’m hangin’ up my herbicide "shootin' iron": a very high-tech, retractable hose spray unit that cost me a pretty penny. It has been relegated to fire-fighting unit and seedling waterer. How will I manage the woody weeds now? Well, first off, I realised that I needed to mind less. A lot of what bugs me about the woody weeds is how damn visible they are from the highway. They look untidy. But hey, I’ve gotten used to people looking at me sideways for leaving the tails on my sheep—what’re a few acres of gorse? Sheep grazing briar rose–it’s not quite a good enough photo to see that they are preferentially eating the rose hips–none left at or below browse level. 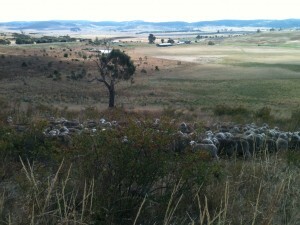 Then, as I’ve continued my experiment with shepherding in conjunction with planned grazing, I realised that I can probably set up the sheep to eat more of the woody weeds. They already keep them under control in the well-grazed areas of the farm—it’s just the rougher bush areas, or places off the beaten sheep track, where most of the problems are. So, when the sheep have had their fill of exotic grasses, I reckon they’ll chow down on gorse for a little while—if I take them to it. Gorse is actually a highly nutritious stock feed, though very prickly. In the 1800's gorse chaff was the mainstay winter feed for working horses in the UK. Sheep definitely eat gorse, so the spines alone don't deter them. However, as in so much of livestock nutrition, it's not realistic to expect the animals to eat it as a monoculture, which is more or less what it gets to be when it's really dense. However, even its density can be positive: thick gorse can protect regenerating trees and shrubs from grazing pressure as they are getting established. I've been doing quite a lot of shepherding, taking the 1000-strong mob to the corners of paddocks that they don't usually get to. Because those areas are neglected, I suppose, they have lots of the woody weeds. It's surprising how enthusiastic the sheep are about heading into these "new" areas--they start exploring and browsing immediately, as if to say, "Why didn't you tell us about this sooner?" And one day, watching the sheep enthusiastically munching the bright red briar rose hips, I realised—it’s all forage. I just have to help the sheep figure it out and incorporate it into their diverse, balanced diets. This one surprised me–I wasn’t expecting this level of enthusiasm for pine needles! It was such a relief to know that there are no longer any plants that I have to hate—they are all a part of my landscape system, and now I get the fun, and challenge, of seeing to it that the woody weeds get their share of being eaten. With the departure of herbicides, I’m left with only two major chemical dependencies: cyromazine, for flystrike, and chocolate, for me. Something tells me the cyromazine will be easier to kick. Using the sheep to “weed” around my house. The pet lambs ended up briefly in the fishpond, but the sheep did eat the exotic grasses quite effectively.